A VISIT to Highland Meat’s Saltcoats plant on Ayrshire’s west coast was on the agenda for 40 group members from the recently-launched Quality Meat Scotland (QMS) Dumfriesshire Monitor Farm at Hartbush, Dumfries, farmed by the Patterson family. Highland Meats was acquired by Irish-based family run business, Dawn Meats, in 1986 and the Patterson family have been regular consigners to the company with prime cattle for nearly 20 years. The main aim of the visit, which followed fast on the heels of the second on-farm meeting the previous week, was to follow through on the cattle selected live on that day and further discuss the selection in relation to the final carcase qualities and in particular to the killing out percentage of the animals. At the previous week’s meeting, the 100 attendees were challenged to assess the cattle on weight, grade, killing out percentage and value. This was supported by demonstrations by George Brown, Dawn Meats, and Jim Ford, of AK Stoddart Ltd, on the preparation of cattle for slaughter. The cattle were then selected to try to show a good cross section of what was required, not only by the abattoir but also the type of quality and finish, which would give the best return to the producer. 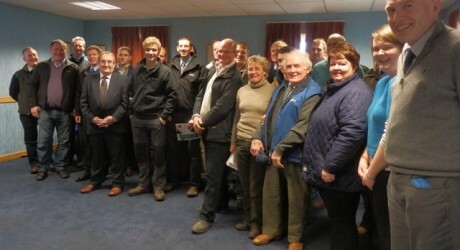 Group members who attended the Hartbush meeting, also heard from Alison Glasgow, technical manager at the Limousin Cattle Society on the use of BASCO, which handles the EBV information for the Limousins, and from Barbara Webster from ABRI Breedplan, which covers the other main British beef breeds. Both Alison and Barbara spoke on the importance of selection using the added advantage of accurate Estimated Breeding Values (EBVs). Not only is it important to consider weight gain, terminal production index and eye muscle depth for bulls but replacement heifers should also be considered relevant to their sire’s calving ease, calving ease daughters and milk EBVs. While EBVs are considered to be an aid to selection, they are becoming increasingly relevant as the accuracy of the figures improves. The reference to the ‘accuracy of the figures’ should not be confused with inaccuracy as it simply means that the more information there is available from parents and siblings of the animal in question, the more accurate or effective the figures are as a tool for selection. The group were treated to a full tour of the facilities at the Saltcoats plant, from the slaughter hall through to the cutting room where they were able to see 80 finished carcases an hour being boned out into their various meat types e.g. topside, silverside etc. This followed on nicely from Jim Ford’s spray paint demonstration on a live animal the previous week, pointing out the various cuts to the assembled audience. The carcases of the Hartbush animals were hung for all to see, with the traceability and coding on the labels explained in detail. The groups later assembled back in the boardroom to look in detail at the results which showed that the best heifer on farm showed an exceptional killing out percentage of 62.7 per cent on a –U4L grading and a deadweight of 377 kilos. There was a ten per cent variation in killing out percentage across the animals, which had been chosen specifically to show the group just what the abattoir was looking for and how the management of cattle, breed, type and condition was all relevant. The cows were probably the most diverse; ranging from having reared calves to losing a calf and having no milk but ultimately they had produced a good return of between £1,157 and £1,300 per head. “The Paterson’s are good suppliers and we could do with this type of cattle all year round,” said Isla Roebuck, The Dawn Group, UK development director, when he addressed the meeting. “We need a sustainable product, which allows the producer to maximise its genetic potential and produce a carcase at the optimum age, grade and weight not only for us but to ensure the best return to the producer. “The results are a credit to John and Amanda Patterson’s hands on approach to regularly weighing their cattle, always being involved in deciding which animals are ready for slaughter, and following through on the slaughter results,” added George Allan of MLCSL. When all of the figures were in, John Patterson’s own estimate of the overall killing out percentage of the 31 heifers forward was only 0.2 kilos adrift from the overall average. With a range of spec for the Highland Meats plant of between 350 – 420 kilo deadweight, there is a significant opportunity for producers to provide cattle for the many specifications required for a company which currently holds 12 per cent of the UK Market.